Spoken word artist Oisín McKenna (above) talks to RTÉ Lyric fm Culture File’s Liam Geraghty about ‘Grindr. A Love Story’. Exploring the “effects of the app, Grindr, on life and love in the 21st century (even references Broadsheet!)”. 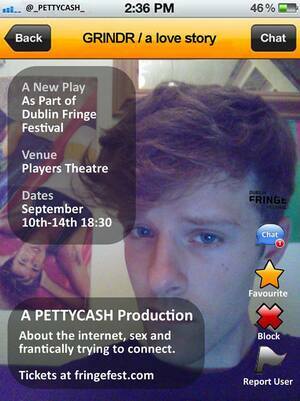 Posted in Misc and tagged Dublin Fringe Festival, Grindr at 11:54 am on September 4, 2013 by Broadsheet.